In every love affair, no matter how lofty or diseased, there comes a time for subterfuge. What does this mean? My dictionary defines subterfuge as: 1. a statement or action resorted to in order to avoid blame or defeat; 2. a place to which a person escapes, a retreat, a refuge; 3. a thing which provides concealment, a cloak. But isn’t love supposed to be transparent, all-revealing? Aren’t secrets to be avoided at all costs? My experience begs to differ. I’m not talking giant gaping secrets that rupture the foundation on which lovers stand. I’m talking tiny rebellions that sprout at one’s feet like errant dandelions or pop up in dreams as unruly fantasies, too vital to be puffed away into oblivion. These are the gems that one can channel into dance, poetry, music – covert arts in which the obscene serves us, obscurely, without obstructing our ability to coincide. Of course, subterfuge can also be a call to action. . .
Why does ecstasy fill us up and deplete us in succession? We can never get enough, so we go to our chosen church saying: I’m afraid I’ll come to nothing, is it necessary to be reborn again and again? I just need someone to embrace me in my contradictions and my complications, someone to compliment me, someone to complement the perfection that constantly confounds me. The sensuality of the word rhododendron first occurred to me when I used it for Vlodoya’s speech in A Warehouse Dream, the way it rolled melodiously off Vlodoya’s tongue. Years later I wrote a love song on my lunch break to this same species. What does it imply to sing, “you are the flower with the almighty power! I don’t mind a spring shower, we’ll spend hour after hour. . .” ? The craving for communion springs eternal. Here’s an admission: I may be a bit of a wallflower, but my little red journals are chock full of flirtation. I always thank my lucky stars for writing. Something about those scribbly vowels and stretchy consonants, sprinkled through with spry commas and peppery periods, that makes me feel, well, flirtatious. I guess you could call it my guilty pleasure. Wordplay, unlike much foreplay, is so portable. And who can deny the thrill of saying “now I’m drinkin’ all this lilac wine with an urchin slurpin’ turpentine, you know you’re never gonna be my valentine!” C’mon, you know you wanna. . .
Love Chart: Mapping the Ride! In the spirit of Valentine’s day/ leap year/ the month of February . . . I wish to offer my public installation Love Chart: Mapping the Ride! What is this? Over the course of seventeen days, I will post original songs as evidence of the peaks and valleys spanning Ideal Love to Heartbreak, the harrowing turns and fateful descents and ascents leading from Obsession to Hope and back again. Please be my guest for a tumultuous ride through the stages and phases of Desire! 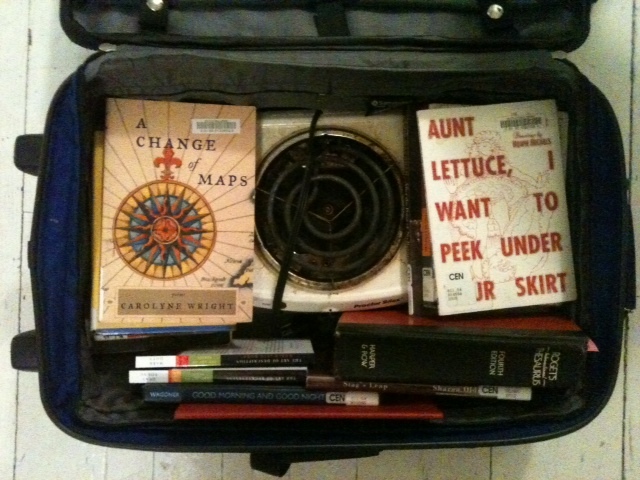 What to bring to a literary residency? Well, at least if I need warmth, I can burn some books. I was nervous going into the holidays because, well, because lately I crave communion with others, and this can be tricky when one lives alone. I remedied this by various means. I accepted all invitations and if possible I added a physical component such as riding my bicycle eight miles to a friend’s house for Christmas dinner. I planned a trip to the small town where my parents live. I sent a text to a friend performing in a holiday broadcast, who then got me a comp for the show and took me along to the cast party afterwards. I agreed to meet families with young children in the park even though it was freezing. I called my son. I arranged for some home repairs to be done and I stayed around to take part. I purchased tickets for the upcoming Patti Smith concert. I drank cider with a mom and her baby. I savored red goat curry. I accepted a ride from a stranger. I called a theatre school and spoke with the admissions director about the classes. I walked many blocks to a bar which was closed, musing about how I like to throw myself across the world’s path. I followed red-nosed arrows on a scavenger hunt which led to a wagonload of princesses in a five year old’s bedroom. I borrowed a car and went ice skating. I drank coffee with a co-worker and dusted off my mental model of the solar system. I agreed to complete a foursome at tennis at the last minute on a bitterly cold night knowing it would feed my mind and body. When a friend texted me on my birthday concerned that I was staying in, I agreed to go out. And when my two friends (one heavily pregnant) wanted to end the night early I followed them home and accommodated their requests for songs to be played on the piano. I drank wine and watched the HBO series GIRLS and decided that it is not altogether foolhardy to throw oneself into casual encounters, that it is human to desire desire. I let myself be touched. I took out my journal and wrote lists for each day, who I had connected with, and what had transpired. And only after seeing the hard evidence, did I stop feeling so insatiable for that elusive thing – human contact – and revel for one moment in my unbelievable bounty. 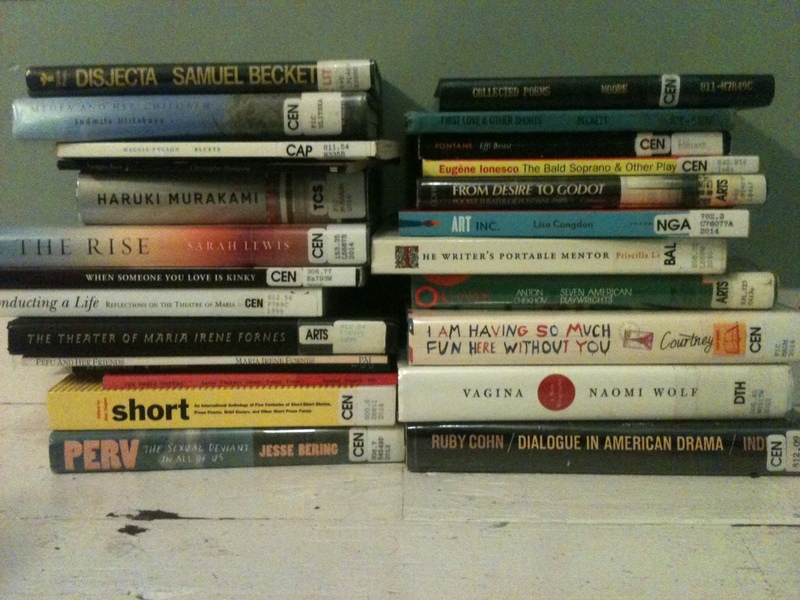 I love my personal library because it is always being refreshed and it is informed by the blurbs I read in magazines and books and blogs and the performances I attend. If a work or artist is mentioned which I am unfamiliar with, but intrigued by, it is brilliantly easy to place a hold, which means at some point in the future, that book will enter my stacks. From there it’s up to fate, whether I’ll open its spine to peruse its contents or not, though one factor increasing probability is what’s commonly known as the due-date. Due-dates are desirable, because we’re all procrastinators, right? The due-date is the secret to life, or at least the key to busting open those musty volumes to see what’s inside. Every 3 weeks the bell tolls; and although there’s a superb chance of renewing, especially the more obscure tomes, it serves as a reminder that the clock is ticking and that one’s reading window is finite. Of course, there is infinite grace here; if a book simply must be returned before one’s time with it is complete, one can place a new hold on it as soon as it’s been put back into circulation. This is a perfect closed circuit, in which books are constantly placed in new hands along with the desire that accompanies an experience which is terminable. Whenever I read excellently penned memoirs, I entertain the idea that my own life could be written in a similarly hypnotic vein. Then I remember, being more mouse than girl, that I shy away from trend-setters and starlets; on the whole I have avoided more often than collided with life. But then Hilton Als, in his essay, Tristes Tropiques, describes himself as “half living life so I can get down to really living it by writing it”, and I think aha! just watch me! My raison d’être is to be where no one notices me like in a bookstore on a saturday night just before closing. 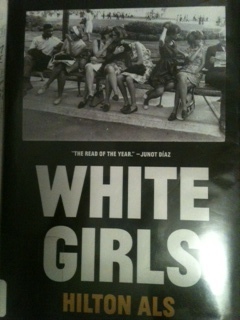 Which is where I was when I saw White Girls with its capitalized title, defiant and oddly familiar. Not being able to pinpoint the arc of his story – messy, contradictory, and addled with cultural references – I was drawn to it. From Tristes Tropiques, “what is grace but the desire to forget one’s body, or share it with others?” Als describes a need, a craving for love which transcends ownership, or even, at times, touch; our search for a “we” or a “I” that acts like a mirror, reflecting back our double, or twin. These days, I yearn for the time to write the essays, poems, plays whose bits rattle about in my brain. When I was young and had the time and money I worked grunt jobs instead of pursuing my craft; I felt that I had no right to write, I had to live first. Now, I try to imagine what this new ideal would look like. If I wrote all day, would I dress up my limbs and paint my face to go out to the bars and cafes at night? Because writing often flits between subjective and objective desire. We are so much in our own heads, we have to feel the world’s eyes on us in return, to feel desirable, and to make the isolation of the work worthwhile. When Hilton Al’s muse says, “what readers crave most, what fills them up, is the story of love, and how it ends,” she speaks for all of us who are watching our lives and loves take root and unravel, while simultaneously putting it all down on paper.